I'm smiling so big because out of a lot of trial and error, I think I finally found a button-down plaid shirt I like. If you read my flannel shirt post HERE, you would know that I've been struggling jumping on the plaid shirt trend for awhile now. I think I finally gave up ever finding a plaid shirt that worked for me and then I had a JCPenney coupon burning a hole in my pocket. Off to the store I went, and I spotted this one. "Hmm, do I or don't I?" I wondered. I decided the least I could do was try it on. I was pleasantly surprised with the fit, so my fourth plaid shirt came home with me. I paired my new plaid shirt with another new purchase, this burgundy Old Navy Textured Frost Free Vest. I own two other nylon vests, a medium weight white vest last shown HERE and a thin black vest last shown HERE. This Old Navy puffer vest is probably the "puffiest" vest of the three, but to my surprise, I love it. I always avoided vests that are too thick because I thought they added unwanted pounds to my frame; however, I love how cozy and warm it is and because my arms and legs are not covered, it doesn't make me look as big as I thought it would. I bought a size Large so I could comfortably fit lots of layers under it. I struggled with choosing between a size Medium and a size Large. The Medium fit perfectly, but I worried if I added a thick sweater underneath it would be uncomfortable. I didn't want to get a size Large because I thought it would make me look bigger, but I think ultimately it was the best choice for layering. I absolutely love the color and fabric of this vest. It's a not a shiny nylon like most puffer vests are. I can't quite describe it, but it's more of a canvas type of material. Because my life in winter involves mostly from walking from a heated building to a vehicle, I have the feeling I will be wearing this vest in place of a winter coat for most of the winter. I get so hot wearing a winter coat inside stores, that this vest is more suitable. Because of the thickness of the vest and the high collar to protect against wind and cold, I will be perfectly warm wearing it for short periods outside. I wore suede black booties from Famous Footwear (old) with grey skinny jeans from Target (old). My infinity scarf was purchased last year from JCP. And here are a couple of pictures of just the shirt. It is by Stylus and it is a size medium. I think the more subtle color and stripes are why I am more comfortable wearing this plaid shirt than others I have tried. The top is also a little longer in the back than it is in the front...which is always a plus for me! Stylus Long-Sleeve Oversized Tunic - JCPenney: HERE, Nicole Miller Kira Satchel (no longer available) similar: HERE, Grey Tassel Infinity Scarf (no longer available) similar: HERE, Grey Skinny Jeans (no longer available) similar: HERE and HERE, Black Suede Booties (no longer available) similar: HERE, and Textured Frost Free Vest - Old Navy: HERE. That button down is absolutely darling! So glad you finally found a plaid shirt that was perfect for you, Amy! I really like the color of it and your puffer vest. They look so great together. Thank you! It took a lot of tries, but I think I finally did it! A really cute outfit. Love the blue and burgundy together! Such a cute plaid shirt! Navy and burgundy are great together! 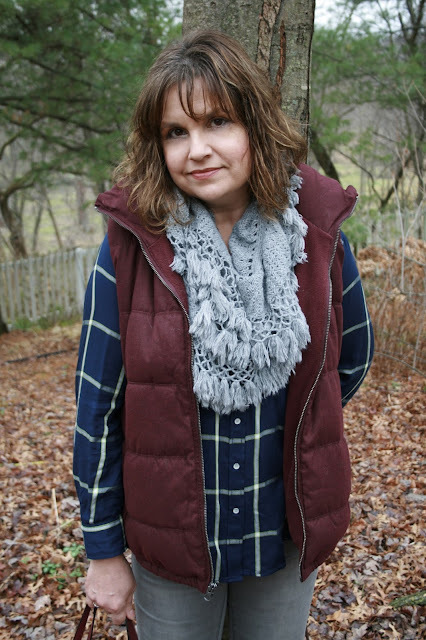 And I love the gray fringe scarf! Super cute look! Thanks Ruth. My daughter took these photos and she mentioned how well navy and burgundy looked together as well. Darling outfit! I really like the color of your new vest. It will go with so many things so you will get lots of wear out of it. I sure know what you mean about plaid shirts. Every time I try to wear one of my vests with a "plaid" shirt, I feel like I should hang a sign "Gone fishing"! I like this plaid, because it looks more feminine. I did just buy plaid vest this weekend and am itching to style it! Thanks Karen, for me, I think burgundy has become the new neutral...I swear it goes with everything! I'm anxious to see your new vest! It's hard for me to find button downs that I love too. They always fit so strange on me! 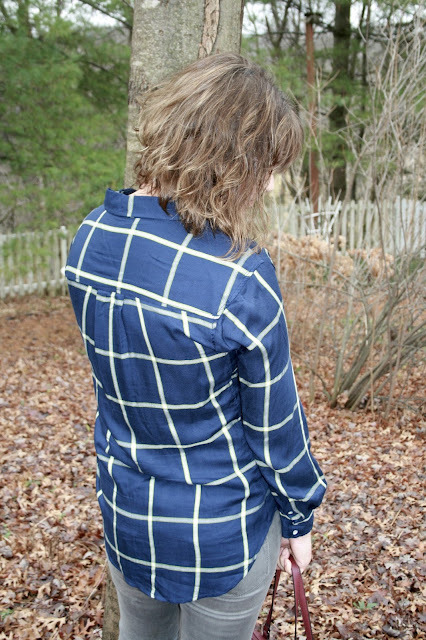 Love the check print! Thanks Shauna! It's good to hear I'm not the only one who struggles with button downs. Thanks Rose. I have the same problem with button-downs due to the same issue. You would think they would make button-downs for women with larger chests. Sizing up is not an option because then it doesn't fit elsewhere. 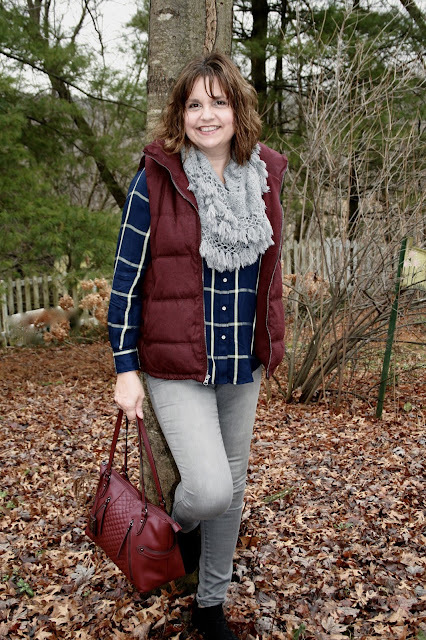 Love the color of this button down - especially paired with the vest - super chic! Thank you so much for linking up with us for Monday Mode! Thanks Rachel, I really like the color too! Hi Amy Love this mix of navy and burgundy! Pretty mix of colors on you. Thanks Jessica, who knew navy and burgundy went so well together? Love it! I love the colors of this outfit! I have a navy vest similar to your vest and I might wear the same look with opposite colors!! Thanks Sarah, that sounds like a great idea! I can't wait to see it! 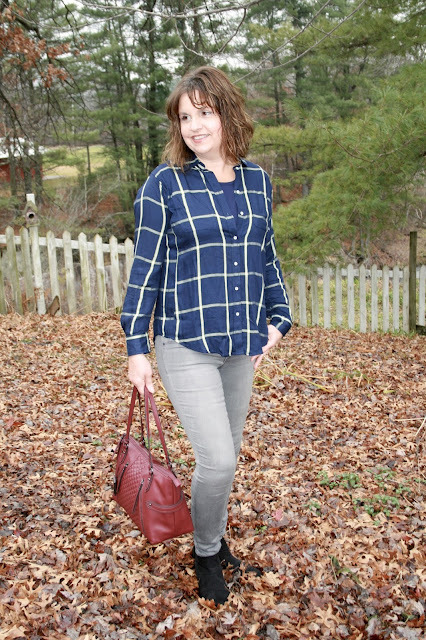 What a great plaid top! And that vest is adorable on you! You can't go wrong with a puffer vest! Thanks Laura, it's taken a few years, but I think I've fallen in love with puffer vests! Doesn't it feel good when you find an item that finally fits the bill, Amy? Love the vest too---I know what you mean about going from warm car to warm building---I always laugh and say that I'm an indoor girl!! Thanks Erica! Glad to know I'm not alone! Thanks for joining Top of the World Style. That shirt is really nice!